The image of The Vinery in today’s post was originally displayed in the exhibition Photographs of Indian Architecture from The India Museum London. It was grouped with five other images under the larger category of Mahomedan Architecture. The Vinery was located in Qaiser Bagh, Lucknow, India. Qaiser Bagh was a walled palace and garden built by Wajid Ali Shah, the last Nawab of Lucknow. Construction began in 1848 and was completed in 1850. These buildings surely attracted attention for Shepherd and Bourne of Simla exhibited a picture of it at the Paris Universal Exhibition in 1867. The comments on the exhibition at the India Museum London were not kind. They noted this series of images were “devoted to that mixture of Eastern outlines with Western details which make up that curious jumble of ideas”. 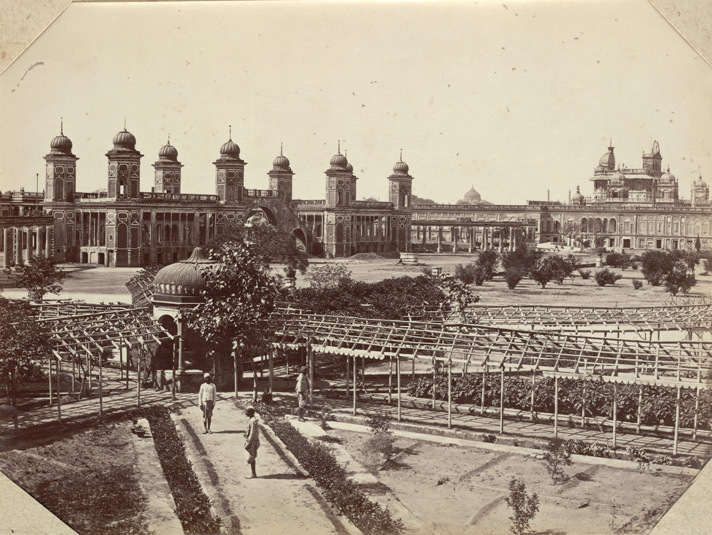 One could not despair for “all the buildings in Lucknow – it became a capital in 1775 – are not equally bad.” The presence of the Vinery raises such questions as what type of vines were planted, where did they come from, what were the soils like, who was in charge, etc.? I would expect the Vinery was used for the cultivation of table grapes but were there vines planted elsewhere for the production of wine? The Vinery, Kaisor Bagh, Lucknow. British Library.